The Northeast Coastal Ocean Forecast System (NECOFS) consists of nested multi-domains of Global-FVCOM, GOM-FVCOM, Mass-Coastal FVCOM and coastal inundation area with inclusions of the land. NECOFS was placed in experimental forecast operation in late 2007. This system was originally set up for the northeast regional domain including the New England Shelf, Gulf of Maine, Massachusetts Bay, Georges Bank, and the Scotian Shelf. NECOFS has been upgraded by including a high-resolution subgrid nested domain model with a horizontal resolution varying from 10 m in estuaries to 0.3 km over the outer shelf for Massachusetts waters and a regional surface wave model. Funded by the NOAA IOOS NERACOOS Program and MIT Sea Grants, we have setup sub-domain inundation models for Scituate, MA, Mass Bay/Boston harbor, MA, the Hampton River, NH and Saco Bay, ME, as a pilot study to test the capability of NECOFS for ”end-to-end” inundation applications. The coastal inundation domain is configured with high-resolution (1-m ´ 1-m) LIDAR bathymetry data. The schematic of multi-domains are presented here and the detailed grid information of each domain is given in. The core of this model system is GOPM-FVCOM It is forced by tides at the open boundary, wind stress, heat flux, net precipitation minus evaporation at the surface, local runoff along the coast, and upstream flow at the Scotian shelf boundary. Surface forcing fields, originally computed using the NCAR/Penn State 5th generation mesoscale meteorological model (MM5) (Chen et al. 2005), are now computed using the NCEP/NCAR WRF model configured for the region. NECOFS was placed into forecast operation in 2007 and the forecast fields are used by the regional NOAA Weather Forecast Offices and US Coast Guard in addition to researchers and the public (http://fvcom.smast.umassd.edu/necofs/). We have established the Northeast Coastal Ocean Forecast System (NECOFS) (http://fvcom.smast.umassd.edu/necofs/) (Fig. 3). NECOFS was placed in experimental forecast operation in late 2007. This system was originally set up for the northeast regional domain including the New England Shelf, Gulf of Maine, Massachusetts Bay, Georges Bank, and the Scotian Shelf. 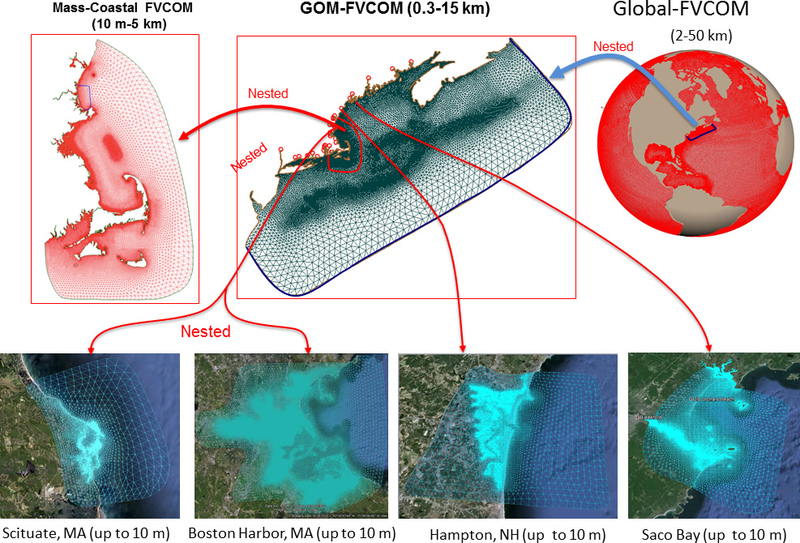 NECOFS has been upgraded by including a high-resolution subgrid nested domain model with a horizontal resolution varying from 10 m in estuaries to 1 km over the outer shelf for Massachusetts waters and a regional surface wave model. Funded by the NOAA IOOS NERACOOS Program, we have setup a sub-domain inundation model for Scituate, MA as a pilot study to test the capability of NECOFS for ”end-to-end” inundation applications. Having validated this model by reproducing the total water level and flooding in Scituate Harbor for selected storm cases in 2005, 2007 and 2010 (Chen et al., 2013; Beardsley et al., 2013), and over New England for the August 1991 Hurricane Bob (Sun et al., 2013), we are presently using MIT Sea Grant funding to this sub-domain inundation model to cover the entire Massachusetts coast, starting with a focus on Massachusetts Bay and Boston Harbor. Configured with high-resolution (1-m ´ 1-m) LIDAR bathymetry data available in the Massachusetts coastal zone in the NECOFS inundation system, we plan to complete the development and validation of this Massachusetts coastal inundation forecast system with our present MIT Sea Grant funding. We recently developed the Northeast Coastal Ocean Forecast System (NECOFS) (Figure 4). The core of this model system is GoM-FVCOM and Mass Coastal FVCOM. It is forced by tides at the open boundary, wind stress, heat flux, net precipitation minus evaporation at the surface, local runoff along the coast, and upstream flow at the Scotian shelf boundary. Surface forcing fields, originally computed using the NCAR/Penn State 5th generation mesoscale meteorological model (MM5) (Chen et al. 2005), are now computed using the NCEP/NCAR WRF model configured for the region. NECOFS was placed into forecast operation in 2007 and the forecast fields are used by the regional NOAA Weather Forecast Offices and US Coast Guard in addition to researchers and the public (http://fvcom.smast.umassd.edu/necofs/). Multi-domain nested FVCOM has been compared with observations. For example, Global-FVCOM was run for a 50-year spin-up simulation, which successfully captures global tidal motion and the major features of subtidal western boundary currents, water motion in the Arctic Ocean, and water transport from the Arctic to the Northwest Atlantic Ocean (Chen et al., 2009c; Gao et al. 2010c-manuscript). Examples of Global-FVCOM are shown in Figure 6 for the Pacific Ocean equatorial instability waves, Gulf of Stream, Kuroshio, the slope flow along the Greenland coast and complex currents through the Canadian Archipelago. Model-data comparisons were made for all available data collected in this latter region. Figure 7 is an example of the model-predicted and observed ice concentration in March and September. The slight difference is believed to be due to the interannual variability of ice concentration, since UG-CICE was driven by the daily-averaged forcing over 1979-1994 and the observed fields represented the averaged field over 1979-1994. Figure 8 shows the comparison of model-predicted and float-derived subtidal currents at 700 m in the NW Atlantic Ocean. The model captured well the magnitude and path of the deep slope current flowing from Greenland coast, crossing Baffin Bay and the Labrador Sea and then entering the western slope off the Gulf of St. Lawrence as well as the Atlantic return flow. Figure 9 shows a comparison of GoM-FVCOM predicted and HF radar-derived surface monthly averaged subtidal currents off Long-Island, NY in April, 2003. The comparison was also made for each month over 2002-2008. The model captured all detailed structures of subtidal currents in the region. The multi-scale nested FVCOM system has also be used to study the responses of marine ecosystems to interannual variability in the physical environment in the GoM. Examples can be viewed at the FVCOM website and published papers (e.g., Huret et al., 2007; Hu et al., 2008, Ji et al., 2006, 2008; 2009; Tian and Chen, 2006; Tian et al., 2009a,b, c; and Hu et al., 2010).